Patricia J. Hermesch, 83, of Osgood, died October 9, 2018, at Aspen Place in Greensburg. She was born October 10, 1934, in Ripley County, the only child of Elza Wise and Crystal (Peetz) Wise Eisert. She graduated from Napoleon High School in 1952, serving as the president of her class. Pat was the head cook at Jac-Cen-Del High School for 23 years and continued working at Jac-Cen-Del Elementary School part-time for many years after she retired. 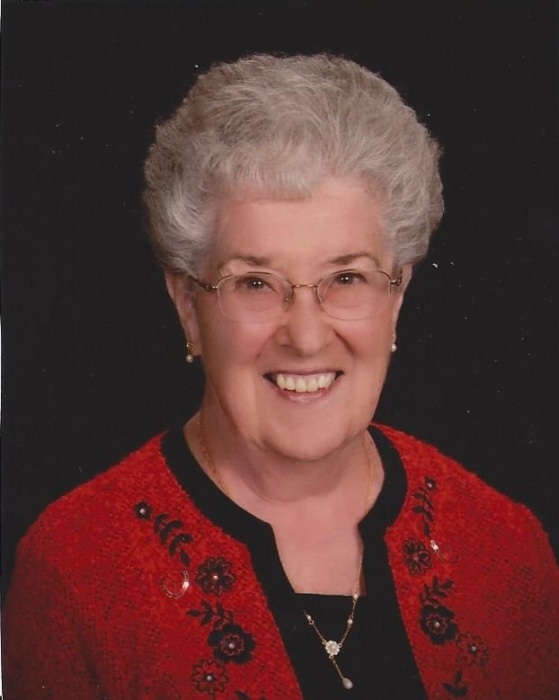 She was an active member of St. Maurice Catholic Church in Napoleon, helping to teach Religious Ed for several years and assisting at many parish events through the Mary and Martha Circle. She was also a member of the Jolly Circle Home Ec. Club. She loved visiting with family and friends, going out to eat, working outside, and was well-known for her love of red birds. Pat married Walter Hermesch on June 8, 1955, at Immaculate Conception Catholic Church in Millhousen, and he survives. She is also survived by one daughter, Kim, Indianapolis, daughter-in-law, Ann, Osgood, and granddaughter, Elizabeth, Osgood. Pat was preceded in death by her parents, son, Doug, and grandson, Douglas Michael. The Mass of Christian Burial will be at St. Maurice Catholic Church in Napoleon on Saturday, October 13, at 10:00, Father Bill Turner officiating, with burial following in the church cemetery. Visitation will be at Neal's Funeral Home in Osgood on Friday, October 12, from 4:00 to 7:00, a Rosary being prayed at 3:30. In lieu of flowers, memorials may be given to St. Maurice Catholic Church or the Napoleon Fire Department.